Johnny Cash is one of those truly rare musicians who not only have come to define a genre but to also have massive cross-over appeal and popularity even with people who claim to hate that genre. While I realize it’s overly simplistic to refer to Cash as a country artist, arguably that’s the style he’s best known for, and whether you’re a metal-head, a fan of classical, or anything in between, everyone can seem to agree on Cash’s stature and merit. If you only have one country album, it’s probably by Johnny Cash. The other musician who can make the same claim is Bob Marley, who defined reggae for multiple generations of music fans. It seems like everyone has owned a copy of Legend at some point in their lives, or at the very least heard it. The only other person I can think of along these lines is Pavarotti, who is the one opera singer that most people can at least name. But my guess is most people have never owned or heard an Pavarotti album and likely couldn’t tell the difference between his version of “La Donna È Mobile” from Placido Domingo’s “Nessun Dorma”, so I’m not sure he counts. Pretty much everyone knows at least one Johnny Cash song. 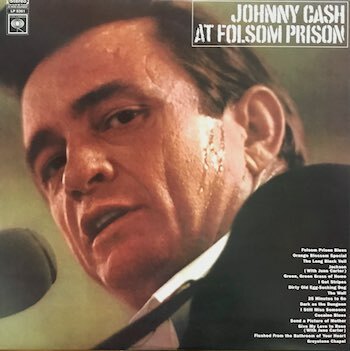 I snagged this 2010 re-release of At Folsom Prison the other day, figuring it was about time that I listened to some of Johnny’s live material. It opens with his trademark, “Hello, I’m Johnny Cash”, then immediately launches into “Folsom Prison Blues”. You can hear the prisoners cheer when he laments I shot a man in Reno just to watch him die, and a again when he calls out the guards with a pig call of Sooie! It’s clear they love him. The songs at this show were picked to resonate with the inmates, like “25 Minutes To Go” chronicling the last 25 minutes of a condemned man’s life and “Cocaine Blues” with its tales of drugs and arrests. He has an easy rapport with the audience, all the more so due to his baiting of the guards and prison administrators. At Folsom Prison sounds great. I like that they left in some of Cash’s talking as well as some of the stage announcements by the prison staff, letting individuals in the crowd know that they needed to report here or there on various prison business. It’s a great collection of lesser known songs played simply, with the emphasis on Cash’s voice. This entry was posted in General Vinyl and tagged At Folsom Prison, Country, Johnny Cash by Administrator. Bookmark the permalink.